Written by torontoai on April 21, 2019 . Posted in Google. Written by torontoai on April 21, 2019 . Posted in NVIDIA. Earth Day is a good day for AI. And the benefits are felt all year, all around the world, as deep learning and NVIDIA GPUs aid our understanding of ecosystems and climate patterns, preserving plants and animals, and managing waste. Whether in a rainforest or urban green spaces, life on Earth relies heavily on trees. But manually monitoring forested areas to track potential risks to plant health is time consuming and costly. Portugal-based startup 20tree.ai is using AI to monitor forests from satellite imagery in a fraction of the time currently required. It uses NVIDIA GPUs inhouse and in the cloud to process some 100TB of new satellite data daily, helping clients analyze tree species, growth and productivity. The Earth is warming, but at what rate? Climate models vary in their projections of global temperature rise in the coming years, from 1.5 degrees to more than three degrees by 2100. This variation is largely due to the difficulty of representing clouds in global climate models. Neural networks can be used to address this cloud resolution challenge, researchers from Columbia University, UC Irvine and the University of Munich found. Developed using an assortment of NVIDIA GPUs, their deep learning model improved performance and provided better predictions for precipitation extremes than the original climate model. This detailed view can improve scientists’ ability to predict regional climate impact. Trying to correctly sort the remains of a lunch into compost, recycling and landfill is a hard enough task for the average person. But if different types of waste are collected together and sent to recycling centers, the trash often can’t be sorted and it all ends up in a landfill. Only 29 percent of the municipal waste generated in Europe in 2017 was recycled. Smart recycling startup Bin-e hopes to raise the recycling rate with deep learning. Using the NVIDIA Jetson TX1, the startup has created a smart recycling bin that automatically recognizes, sorts and compresses waste. Its AI, trained on NVIDIA TITAN Xp GPUs, takes an image of each piece of trash and determines whether it’s paper, aluminum, plastic or e-waste before depositing it into the correct bin. DNA sequencing isn’t just for the human genome. Nanopore sequencing, a technique for DNA sequencing, can be used to analyze the genomes of plants and microorganisms. UK.startup Oxford Nanopore Technologies is using recurrent neural networks to help scientists detect pathogens in cassava plant genomes. It’s also analyzed the DNA of microbial sea life off the coast of Alaska, giving researchers a better understanding of ocean biodiversity and the effects of climate change on marine microorganisms. Oxford Nanopore’s MinIT hand-held AI supercomputer is powered by NVIDIA AGX, enabling researchers to run sequence analysis in the field. Due to centuries of whaling by humans, just 500 North Atlantic right whales still exist. Those left have been forced by climate change to adopt a new migration path — exposing them to a new threat: commercial shipping vessels that can accidentally strike whales as they pass through shipping lanes. Autonomous drone company Planck Aerosystems is working with Transport Canada, the national transportation department, to identify whales from aerial drone imagery with AI and NVIDIA GPUs. The tool can help biologists narrow down thousands of images to identify the few containing whales, so ships can slow down and avoid the endangered creatures. Learn more about how GPU technology is driving applications with social impact, including environmental projects. Written by torontoai on April 17, 2019 . Posted in NVIDIA. Whether you’re a robot or a college student, it helps to start with the fundamentals, says a leading robotics researcher. While robots can do amazing things, compare even the most advanced robots to a three-year-old and they can come up short. Pieter Abbeel, a professor at the University of California, Berkeley, and cofounder of Covariant.ai, an AI company, has pioneered the idea that deep learning could be the key to bridging that gap: creating robots that can learn how to move through the world more fluidly and naturally. Teaching robots new skills is similar to taking classes in college, Abbeel explained on the latest episode of the AI Podcast. While college courses may not immediately qualify a student for a job, the classes are still important in helping students develop fundamental skills they can apply in all kinds of situations. Abbeel uses the same approach in his robotics research. At last month’s GPU Technology Conference, he showed a robot learning to navigate a new building it’s never been in before. His talk will be available here starting May 1. Similarly, college students should look for classes that can teach them skills they can apply broadly. For younger students interested in getting a head start in AI and deep learning, Abbeel encourages them to look into physics. “When I think about the foundations, the things you would learn early on, that will help a lot — they’re essentially mathematics and computer science and physics,” said Abbeel. “And the reason I say ‘physics,’ which might be slightly more unexpected in the lineup, is that physics is all about looking at the world and building abstractions of how the world works,” he said. Abbeel also recommends getting involved in research. Our AI Podcast is available through iTunes, Castbox, DoggCatcher, Google Play Music, Overcast, PlayerFM, Podbay, PodBean, Pocket Casts, PodCruncher, PodKicker, Stitcher, Soundcloud and TuneIn. Talk about a knotty problem. Lucidyne Technologies has been using AI since the late 1980s to detect defects in lumber products. But no matter how much technology it’s employed, finding imperfections in wood boards — a process that’s critical to categorizing lumber and thus maximizing its value — has remained a challenge. It’s a job tailor-made for AI, and Lucidyne has jumped in with both feet by building a cutting-edge scanning system for lumber mills that’s powered by GPU-enabled deep learning. With lumber flying through at speeds of up to 35 mph, the company’s GradeScan system — which physically resembles a mashup of an assembly line station and an MRI machine — scans two boards a second. It detects and collects visual data on 70 different types of defects, such as knots, fire scars, pitch pockets and seams. Lucidyne’s system detects numerous kinds of defects in lumber: orange = bark pocket; forest green = fire scar; red = live knots; bright green = dead knots; blue = pitch pockets; pink = minor seam. It then applies a deep learning model trained on a combination of NVIDIA GPUs, with a dataset of hundreds of thousands of scanned boards across 16 tree species, all of which have been classified by a team of lumber-grading experts. To generate the most revenue, the model’s underlying algorithm determines the optimal way to cut each board — navigating around defects measuring as little as 8/1,000th of an inch. Those instructions are then sent to the mill’s saws. Each mill’s findings are fed back into Lucidyne’s dataset, continuously improving the accuracy and precision of its deep learning model. Thus, there’s no end to how much mills will be able to learn about the lumber they’re milling. A typical scanning application might involve categorizing lumber into one of six grade types, with grade 1 being the most valuable, for example. After scanning a 20-foot board, Lucidyne’s system might determine that the best cut will remove a 2-foot defective section near the center, leaving two 8-foot grade 1 and 2 sections on either side, and an additional 2-foot section of trim, which might be sold to a sawdust manufacturer. This level of detail separates Lucidyne from the competition by enabling mills to drastically improve the precision of their lumber-grading efforts. Lucidyne started deploying GradeScan systems, powered by its Perceptive Sight software, in 2017, with each unit performing inference on NVIDIA P4 GPUs. The company is now deploying systems with newer NVIDIA T4 GPUs. Freeman said the new system is delivering 16x the data processing speed, and at a higher image resolution to boot. The upshot is that Lucidyne’s decision to travel a deep learning path toward increasingly detailed identification of defects has paid off exactly as it hoped. To that end, the company is working with NVIDIA to develop customized software that extends fine-grain inferencing capabilities using semantic segmentation. In the meantime, Lucidyne is riding every wave of increased computing power to zoom in on smaller and more subtle defects. It has recently begun grading redwood, which is much harder to scan because of its color variations. It’s also looking to expand into hardwoods and eventually hopes to tackle other challenges faced by mills. All of this innovation has Lucidyne’s technical leaders feeling that they’re onto something bigger. As a result, they have an eye on disrupting other sectors where inspection of organic materials is involved. Written by torontoai on April 16, 2019 . Posted in Google. As an example, consider how MorphNet calculates the computation cost (e.g., FLOPs) of a neural network. 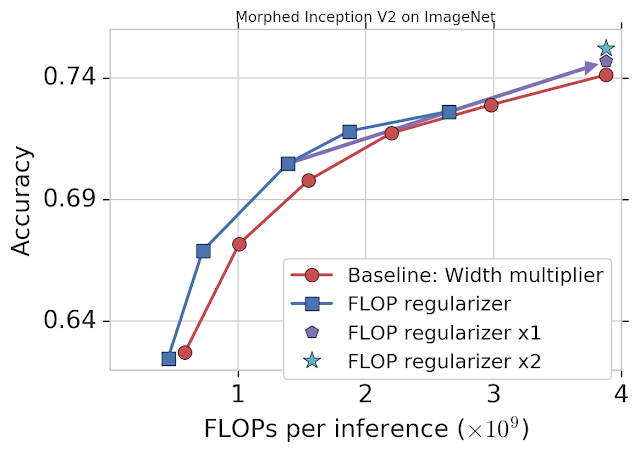 For simplicity, let’s think of a neural network layer represented as a matrix multiplication. In this case, the layer has 2 inputs (xn), 6 weights (a,b,…,f), and 3 outputs (yn; neurons). Using the standard textbook method of multiplying rows and columns, you can work out that evaluating this layer requires 6 multiplications. One could halt MorphNet after the shrinking phase to simply cut back the network to meet a tighter resource budget. This results in a more efficient network in terms of the targeted cost, but can sometimes yield a degradation in accuracy. Alternatively, the user could also complete the expansion phase, which would match the original target resource cost but with improved accuracy. We’ll cover an example of this full implementation later. Portability: MorphNet produces networks that are “portable” in the sense that they are intended to be retrained from scratch and the weights are not tied to the architecture learning procedure. You don’t have to worry about copying checkpoints or following special training recipes. Simply train your new network as you normally would! Written by torontoai on April 16, 2019 . Posted in NVIDIA. In a massive healthcare organization, even a small improvement in workflow can translate to major gains in efficiency. That means lower costs for the healthcare provider and better, faster care for patients. UnitedHealth Group, one of the largest healthcare companies in the U.S., is turning to GPU-powered AI for these kinds of enhancements. In a talk at the GPU Technology Conference last month, two of the organization’s AI developers shared how it’s adopting deep learning for a variety of applications — from prior authorization of medical procedures to directing phone calls. Deep learning models can meet that high bar, he says. Optum is using a number of NVIDIA GPUs, including a cluster of V100 GPUs and the NVIDIA DGX-1, to power its deep learning work. Healthcare providers often need prior authorization, or advance approval from a patient’s insurance plan, before moving forward with a procedure or filling out a prescription. Manually approving procedures currently costs Optum hundreds of labor hours and millions of dollars a year. In addition to checking whether or not a patient’s insurance plan covers a treatment, the healthcare provider must gather information from several sources to confirm that it’s necessary for a given patient to have a procedure or take a particular medication. With deep learning models, much of this decision-making could eventually be done automatically. Zhu and her colleagues are developing neural networks that can conduct prior authorization in real time. The AI is currently in production and is being benchmarked against the manual process. The team found its deep learning model outperforms the traditional machine learning model by a significant margin against a high volume of cases. This process can be streamlined with deep learning. By implementing AI in its call system, UnitedHealth Group can use natural language processing models to understand what callers are looking for and answer automatically, or route them to the right department or service representative. Rekesh is working on developing neural networks that can accomplish these tasks, with the goals of reducing call length and connecting patients and customers to answers more quickly. To do so, he’s using OpenSeq2Seq, an open-source toolkit for NLP and speech recognition developed by NVIDIA researchers. Deep learning models can also be used to streamline the process of authenticating patients’ identities on the call. For customer representatives, an AI-powered interface can help them during the call by pulling up the patient’s records or providing recommendations on the agent’s computer screens. Optum plans to deploy some of these deep learning models later this year. The organization is also working on neural network tools for multi-disease prediction and medical claim fraud detection. Written by torontoai on April 16, 2019 . Posted in Amazon. Hello, my name is Zeina, I am the Arabic Amazon Polly voice. Very nice to meet you. مَرْحَباً، اِسْمِي زينة، أَنا اَلْصَوْتُ اَلْعَرَبِيُّ فِي أمازون بولي، سَعِدْتُ بِلِقائِكُم. The prince of princes ordered to drill a well in the desert, how many R’s in this sentence? Arabic is one of the most widely spoken languages in the world, but – it’s not really a single language at all. It consists of 30 dialects, including its universal form, which is Modern Standard Arabic (MSA). As a result, it’s classified as a macrolanguage and is estimated to be used by over 400 million speakers. Zeina follows the MSA pronunciation, which is the common broadcasting standard across the region. MSA might sometimes sound formal because it differs from day-to-day speaking style. However, it’s the linguistic thread that links the Arabic native-speakers worldwide. Arabic is written from right to left and includes 28 letters. Short vowels (diacritics) are not part of the Arabic alphabet. As a result, one written form might be pronounced in several different ways with every option carrying its own meaning and representing a different part of speech. Vocalization can’t be performed in isolation because correct pronunciation depends heavily on the linguistic context of each word. In a real life situation Arabic readers add diacritics during reading to disambiguate words and to pronounce them correctly. In the TTS voice development process Arabic requires a diacritizer that predicts the diacritics. The Amazon Arabic TTS voice handles unvocalized Arabic content thanks to the in-build diacritizer. If a customer provides vocalized input, Zeina generates the corresponding audio as well. “The launch of Arabic support for Amazon Polly comes at a great time as we are gearing up to launch Arabic as a new language on Duolingo. Zeina delivers accurate and natural sounding speech that is important for teaching a language, and matches the quality that we’ve become accustomed to using Amazon Polly for the other languages that we offer,” said Hope Wilson, Learning Scientist at Duolingo – a globally operating eLearning platform offering a portfolio of 84 language courses for more than 30 distinct languages. Amazon Polly is a cloud service that uses advanced deep learning technologies to offer a range of 59 voices in 29 languages to convert written content into human-like speech. The service supports companies in developing digital products that use speech synthesis for a variety of use cases, including automated contact centers, language learning platforms, translation apps, and reading of articles. Marta Smolarek is a Program Manager in the Amazon Text-to-Speech team. At work she connects the dots. In her spare time, she loves to go camping with her family. Written by torontoai on April 15, 2019 . Posted in Amazon. The inaugural Amazon re:MARS event pairs the best of what’s possible today with perspectives on the future of machine learning, automation, robotics, and space travel. Based on the exclusive MARS event founded by Jeff Bezos, Amazon re:MARS brings together the world of business and technology in a premier thought-leadership event. With more than 100 sessions, business leaders have the opportunity to hear best practices for implementing emerging technology for business value. For developers, re:MARS offers technical breakout sessions and hands-on workshops that dive deep into AI and robotics tools from AWS and Amazon Alexa. You’ll also hear from leading experts across science, academia, and business. Speakers such as Jeff Bezos, founder and CEO of Amazon; Andrew Ng, founder and CEO of deeplearning.ai and Landing AI; Robert Downey Jr, actor and producer; and Colin Angle, chairman, CEO and founder of iRobot, will share the latest research and scientific advancements, industry innovations, and their perspectives on how these domains will evolve. Register today for Amazon re:MARS and visit the session catalog for the latest lineup! There’s a lot in the works. Here’s a taste of the breakout topics and technical content for beginners and advanced technical builders. GE Healthcare has developed machine learning models using Amazon SageMaker to track and predict brain devel­opment in a growing fetus. Powered by these models, the new offering SonoCNS drives the placement of the probe to evaluate congenital and neurological issues in the fetus, for example, to accurately measure and understand brain volume growth. Using Amazon SageMaker for machine learning, GE Healthcare’s operators can quickly detect abnormalities, helping to save babies’ lives and give parents peace of mind. For hospitals, this also translates to improved productivity, efficiency, and accuracy. As one of the largest banks in the U.S., Capital One prioritizes a responsible and well-managed data environment and ecosystem. To meet these needs, Capital One has combined machine learning and native AWS graph capabilities to build a platform that proactively informs access levels for individual associates and teams. The platform results in a faster, enhanced on-boarding process, workflow, and productivity for associates, and helps mitigate risk through proactive management of privileges and licenses. How close are we to fully autonomous vehicles? What would happen if we put the current technology on the road today? What are the problems that still need to be solved? This session will cover the latest advances in self-driving cars without the marketing, providing a true picture of how far we are from never touching a steering wheel again. TED Talks are a powerful way to share ideas and spark dialogue. To make TED content accessible, volunteer trans­lators need to subtitle more than 300,000 minutes of video this year alone. See how TED leverages Amazon Tran­scribe and Amazon Translate to speed up the creation of crowdsourced subtitles, expand the online reach of ideas, and transform subtitle production in media. For the last 10,000 years, large-scale agriculture has lived outdoors, optimized to withstand unpredictable environ­mental conditions and long supply chains. But what possibilities do you unlock when you can control every single environmental factor, from the light intensity to nutrient mix to air flow? In this talk, learn how Bowery Farms uses machine learning and computer vision to optimize indoor vertical farms and scale agricultural production to create higher yielding, better tasting, safer, and more sustainable locally-grown produce in cities around the world. One third of all food produced globally is lost or wasted before it is consumed, according to the Food and Agriculture Organization of the United Nations (FAO). This equals a loss of $750 billion annually. With AWS IoT, Bayer Crop Sci­ence can prevent process loss in real time and use real-time data collection and analysis for its global seed business, collecting an average of one million traits per day during planting or harvest season. Consumers increasingly expect connected products in their home to deliver easy-to-use and personalized experiences tailored to their home and activity. To deliver such a personalized experience, the smart home needs to intelligently coordinate diverse connected devices located throughout the home. This talk will focus on how robots operating in homes today are ideally positioned to enable this intelligence by providing a constantly updated under­standing of the physical layout of the home and the locations of each connected device within the space. Learn how Kinect Energy Group uses advanced machine learning capabilities to predict electric spot prices for re­gional power markets using the Amazon SageMaker DeepAR time-series forecasting model, incorporating historical pricing and weather data to drive the machine learning models. Improved price predictions assist with increased trading volumes for forward pricing contracts. What if you could learn more about your facility from your tablet than by walking around it yourself? Through 4D interactive virtual worlds, Woodside’s “Intelligent Asset” offers an immersive experience in which operators can explore their facility remotely in real time. Learn how Woodside, the leading energy provider in Australia, combined the latest AWS services including Amazon Kinesis Video Streams, Amazon SageMaker, AWS RoboMaker, and AWS IoT. Distributed edge learning, which leverages on-device computation for training models and centrally aggregated an­onymized updates, is a promising new approach capable of achieving customer-level personalization at scale while addressing privacy and trust concerns. Practitioners, employers, and users of AI should understand this new edge-first paradigm and how it will impact the discipline in the near future. The United Nations has outlined 17 Sustainable Development Goals that address global challenges such as poverty, hunger, and health. While the goals are focused on life on Earth, space-based data and machine learning are yield­ing insights. Learn how a combination of analytics and satellite imagery are helping solve pressing problems. Human settlement of space will pose one of the grandest challenges in history. We imagine entire communities living on the moon and beyond without depending on constant supervision or support from Earth. We’ll discuss the challenges for sustainable life in space, and our plan to use artificial intelligence to ensure the safety and wellbeing of our first space settlers. INVISTA is a manufacturer of chemicals, polymers, fabrics, and fibers and delivers products and brands incorporated into your clothing, your car, and even your carpet. Join this session to learn about INVISTA’s transformative journey from BI to AI, where they will share their experience empowering data science by adjusting talent and processes and building a modern analytics platform. Experimentation with change manage­ment, project management, model maintenance, and development lifecycles has helped drive profitable innova­tions. Viacom and Xandra are collaborating to push the limits of voice design with a focus on exceptional user experience. Nickelodeon’s SpongeBob Challenge is one of the highest-rated Alexa skills for kids. Learn how to build delight and fun into an Alexa skill through conversation design, rich soundscapes, advanced game mechanics, and analytics. This technical session will outline the core technologies behind the custom-built Just Walk Out technology for Ama­zon Go. Learn about the algorithmic challenges in building a highly accurate customer-facing application using deep learning and computer vision, and the technical details of the high throughput services for Amazon Go that transfer gigabytes of video from stores to cloud systems. Using real-world examples, this session will explore how to understand, measure, and systematically mitigate bias in machine learning models. Understanding these principles is an important part of building a machine learning strat­egy. This session will cover both the business and technical considerations. This session will take a closer look at the incredible bodies of cockroaches, geckos, and other small animals to exam­ine what it can teach robotics engineers. The session will also outline the latest developments in the field of mi­crorobotics, real-world applications of these robots, and hint at how close (or far) we are from realizing predictions from science fiction. Robots can help save our fragile planet. This session discusses the importance of leveraging robotic technology to save our oceans, detailing efforts underway to create an affordable, unmanned undersea robot designed to dive 1000 feet deep and control the lionfish popula­tion. Intended for use by fisherman, tourists and environmentalists, the RSE Guardian robot will address a serious environmental problem by creating an economically scalable solution for catching lionfish, establishing a new food source, and inspiring future generations in the process. For decades, sci-fi movies have shown the promise of life with bionic limbs, but they are nowhere to be seen in to­day’s society. We have created an open-source bionic leg to help transform these robots from fiction to reality. This talk will focus on innovations in our design approach and showcase a leading AI-based control strategy for wearable robots. Finally, we’ll demo our open-source bionic leg in action with a participant on stage. Can a cloud in space impact the world’s poverty? Are there ways to make agriculture more efficient? Can internet connectivity for the world change how the world lives? Join this interactive discussion as we consider new approach­es to solving Earth’s problems including how a cloud in space could positively impact our lives using space data. This year, Blue Origin will send its first astronauts to space on its New Shepard rocket. Democratization of space is key to the company’s long-term mission to enable a future where millions of people are living and working in space, moving heavy industry off Earth to protect and preserve the planet for generations to come. To achieve this, the cost of access to space must be lowered, which is why Blue Origin is focusing on the development of operational­ly reusable rockets to send more humans to space than ever before. Join Patrick Zeitouni, the head of Advanced Development Programs for Blue Origin, on the journey to that future. Hear about operational reuse at work and the important part the Moon plays in humanity realizing this bright future. Ever wondered what it takes to create an autonomous race car? Come join us for this half-day workshop, and you’ll get hands-on experience with reinforcement learning. Developers with no prior machine learning experience will learn new skills and apply their knowledge in a fun and exciting way. You’ll join a pit crew where you will build and train machine learning models that you can then try out with our AWS DeepRacer autonomous race cars! Please bring your laptop and start your engines, the race is on! Until recently, developing machine learning models took considerable time, effort, and expertise. In this workshop, you’ll learn a simple end-to-end approach to machine learning, from how to select the right algorithms and models for your business needs, how to prepare your data, then how to build, train, and deploy optimized models. Upon completion of this full-day workshop, you’ll have learned the latest machine learning concepts such as reinforcement learning and deep learning by using Amazon SageMaker for predictive insights. In this session, you’ll use computer vision and machine learning to help your team win the re:MARS Blackjack Challenge. During this half-day course, you’ll form teams to build and train a neural network for computer vision using Amazon SageMaker, and develop an algorithm to make decisions that give your team the best chance to win. The team with the highest simulated earnings will win the re:MARS Blackjack Challenge and a coveted patch commemorating their experience. Teach a robot how to find a needle in a haystack. In this workshop, you’ll learn how to develop a robot that can roam around a room and identify objects it encounters, searching for a specific type of item. You will get hands-on with AWS RoboMaker, and learn how to connect robots to a huge variety of other AWS services, like Amazon Rekognition and Amazon Kinesis. Upon completion, you’ll have trained a robot to find what you’re looking for in a pile of irrelevant data. From microwaves to cars, we are headed towards a future surrounded by devices that can communicate with the world around them. In this hands-on session, you will learn how to add custom voice control to your connected devices with Alexa. Leave your laptop behind—bring your big ideas, and we’ll supply the hardware. You’ll create an Alexa built-in prototype, AWS IoT “thing,” and your own Alexa skill—all on a Raspberry Pi. You’ll walk out with your own voice-enabled prototype that interfaces with whatever inputs and outputs you can imagine. Nearly every science fiction story has shown us that voice interfaces are the future. This workshop will show you how to make that science fiction a reality. Bring your laptop, because this hands-on session will teach you the advanced topics required for creating compelling voice interfaces. You will learn how to build Alexa skills, how to design conversational experiences, and how to your brand and monetize your best content. Cynthya Peranandam is a Principal Marketing Manager for AWS artificial intelligence solutions, helping customers use deep learning to provide business value. In her spare time she likes to run and listen to music. Written by torontoai on April 15, 2019 . Posted in Microsoft.